The heart of our thoughtful scholarship and innovative teaching is found on the reorganized second and third floors. More classes will have dedicated spaces, and individualized instruction will find new space as well. New meeting rooms will provide privacy for important conversations, especially about high school placement. An additional 8th grade classroom, providing our oldest students their own space for their important final year at Cathedral. Expanded office and private conference room for high school counseling and Director of Inclusion and Community Engagement. 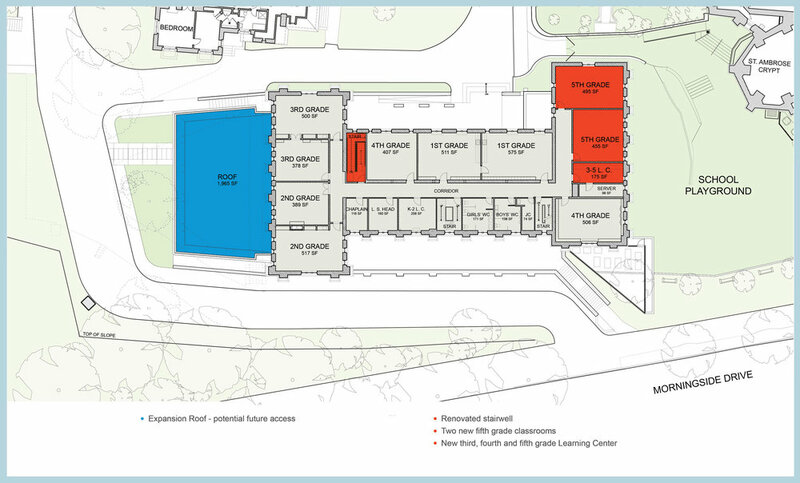 A new learning center for grades 6–8. Two new 5th grade classrooms. A new learning center for grades 3-5. The roof of the expansion addition will be ready for future green space and an outdoor learning area.